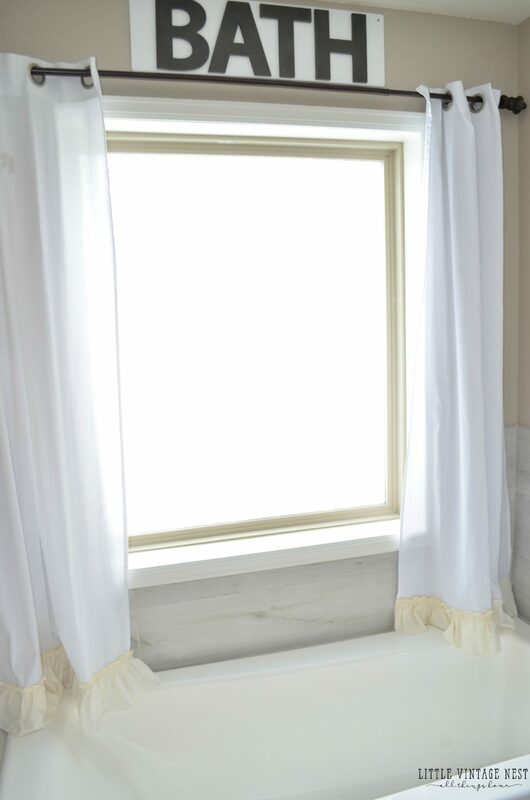 Today’s post is all about the farmhouse curtains I made for our master bathroom that involved absolutely no sewing. None. Zilch. Nada. 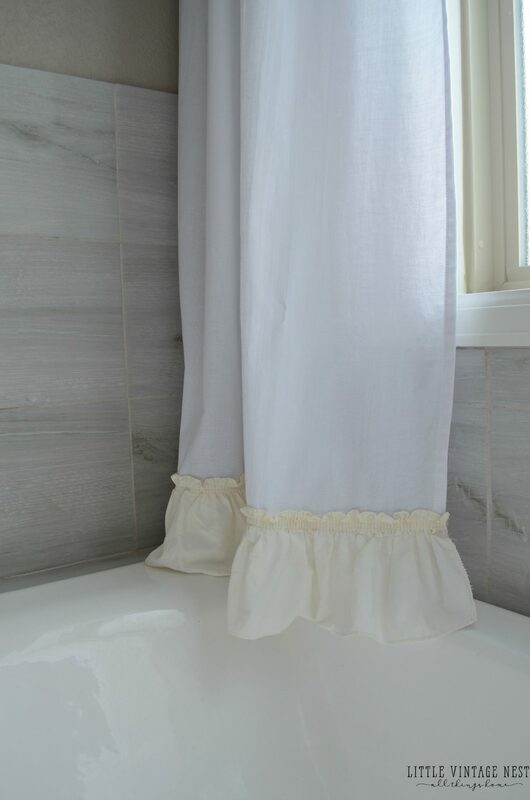 I’m actually really excited to share how I created these curtains using two ruffled aprons. Yes, aprons! Let’s get started. 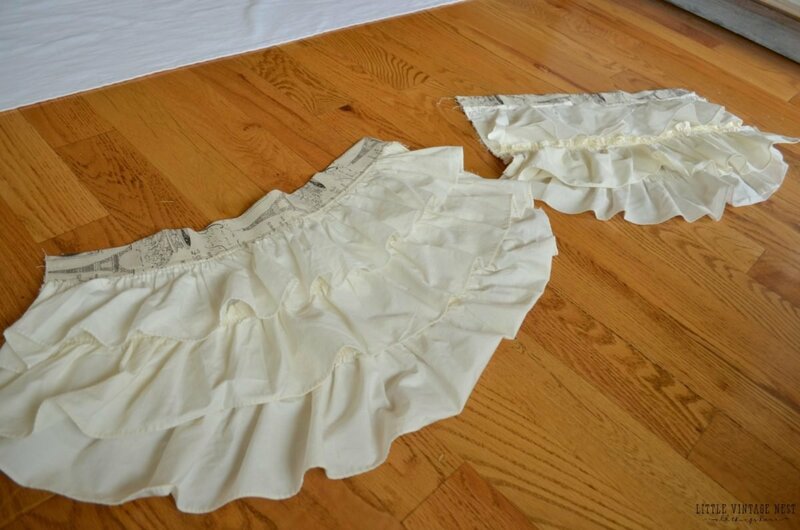 Several months ago I found a pair of the cutest ruffled aprons on clearance at a local antique shop. I bought them with the intentions of using them for a DIY project, I just wasn’t sure what that would be exactly. So I put the aprons away and forgot about them. 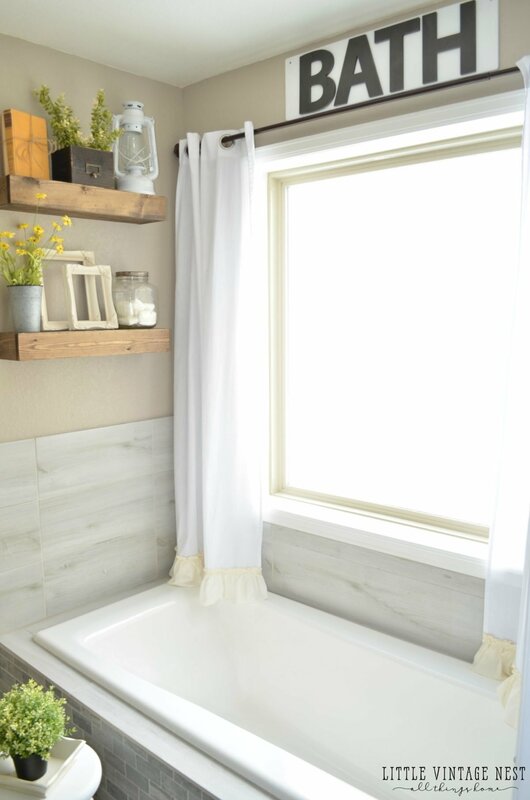 Until last week when I was working in our master bathroom and wishing I had white farmhouse curtains for the window over our bathtub. Of course I wanted to run to Etsy and order something cute, but instead I decided to try to make my own. And that’s when I remembered I had those aprons stuffed in a drawer, just waiting for this project! Here they be! I cut the strap off before taking this photo (sorry!) but you can see they had a Paris themed waistband at the top and that pattern continued to the straps. BUT the best part was the lovely ruffles. 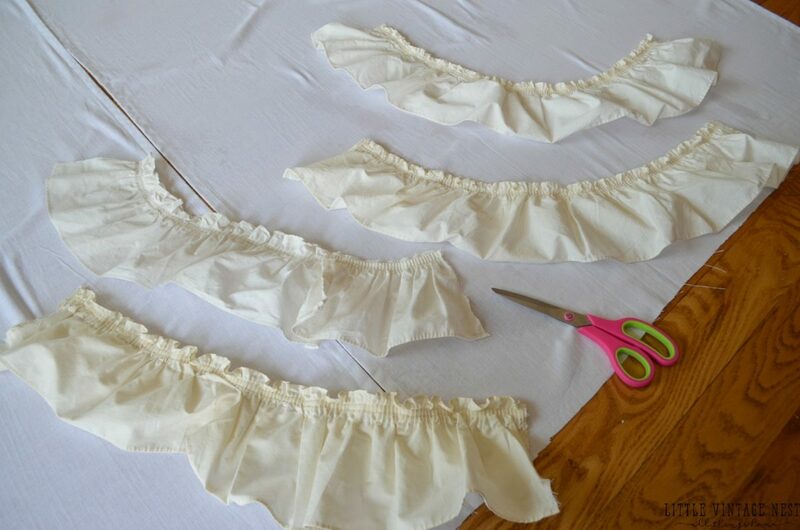 I began by lifting each ruffle up and cutting them off in strips. 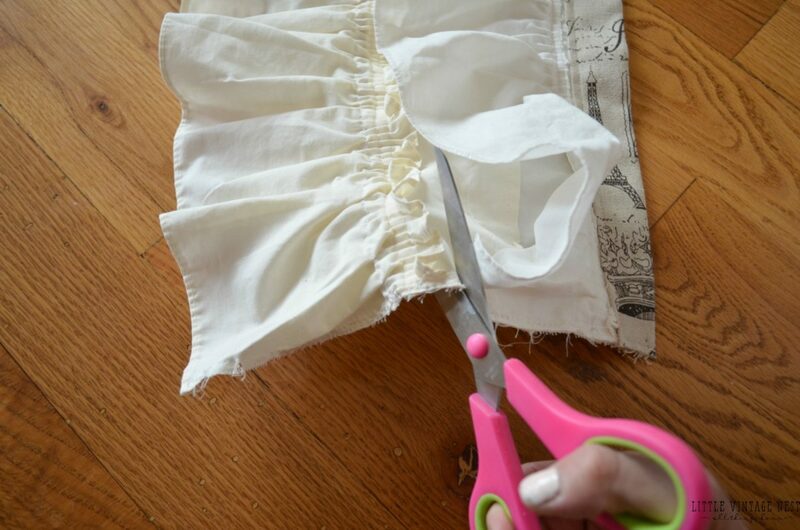 This was actually really easy to do because the seam was in the perfect spot to get the full ruffle off. I cut two strips off each apron. Now to the curtains. These are just standard white curtains I found at Target. 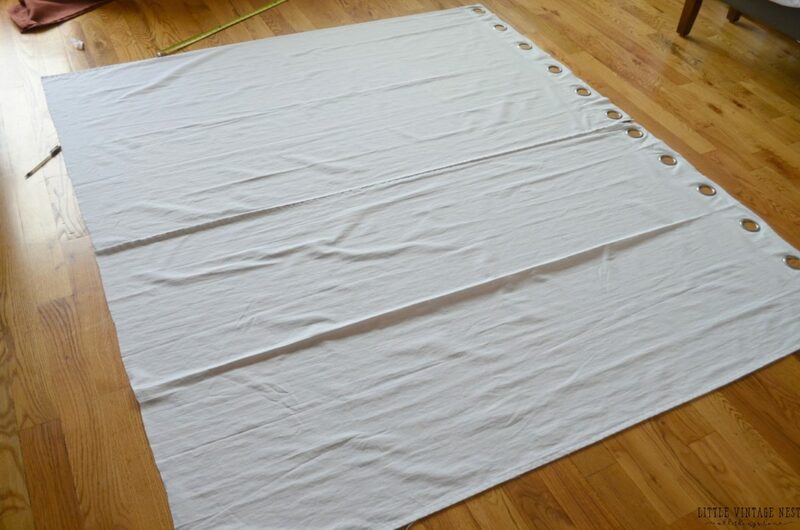 They are a nice thin cotton fabric, which worked really well for this project. I measured the length of my window and cut each curtain to size. These ended up being about 70″ long, which I would have needed to custom order if not for this idea. Thank goodness for DIY…and tacky glue! 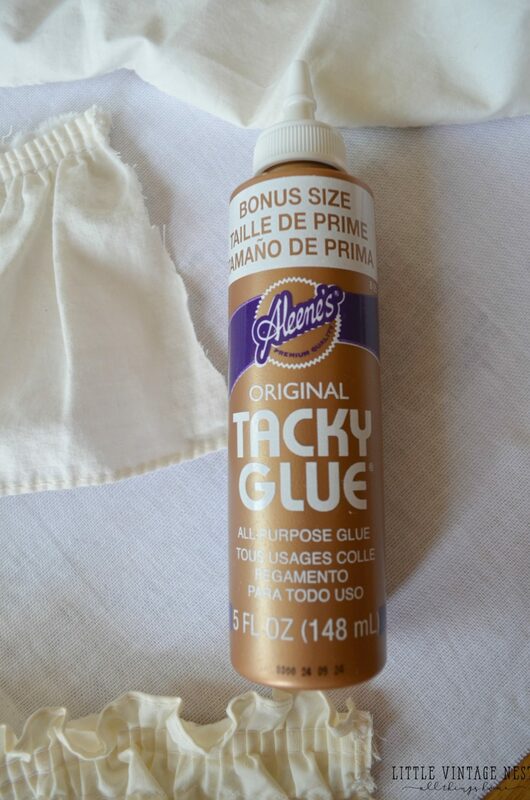 Yes, tacky glue. Good old tacky glue. Have you used this stuff before? It’s magic. And surprisingly really strong. 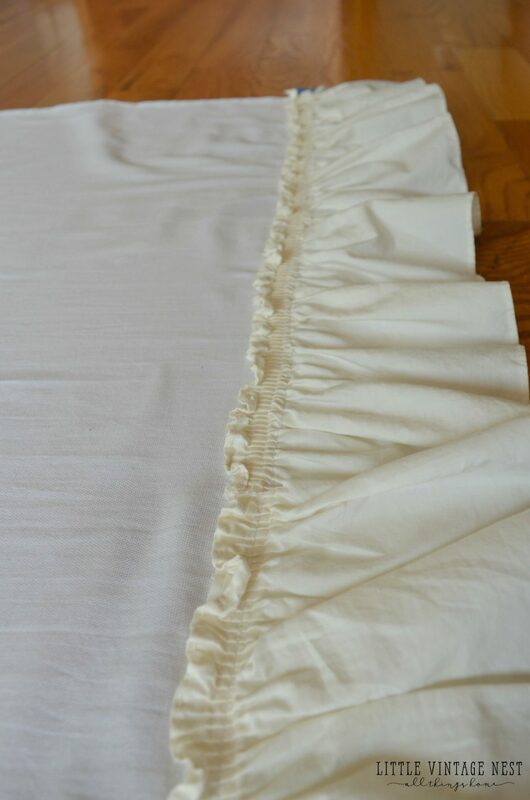 I simply laid each ruffle strip about 3 inches from the bottom of each curtain. I did this the lazy way and just laid the curtains side by side so I would be able to keep them even. 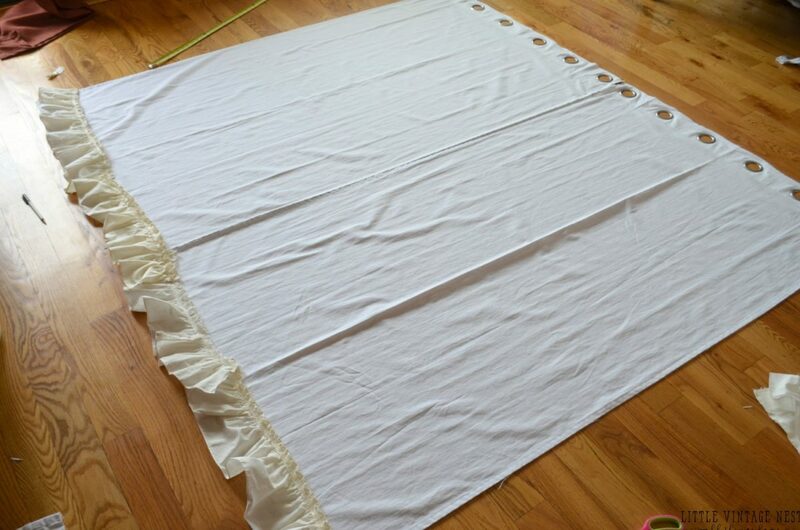 It took two ruffles to cover the length of each curtain. I lined the back of each strip with tacky glue and firmly pressed it on the curtain. If you do this on the floor like I did, I would suggest putting painters tape underneath to keep it from sticking. Easy peasy! I let it dry for about an hour and boom, done! 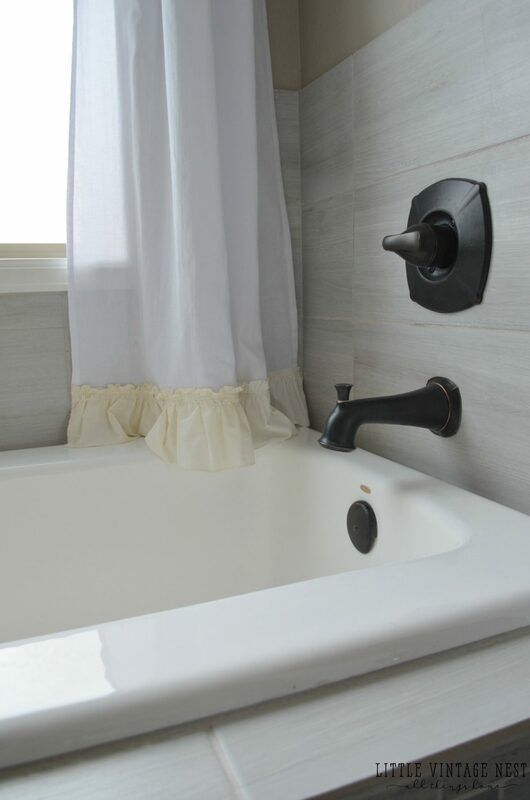 They add the perfect touch to our master bathroom. And I love the combination of the cream colored ruffles with the white curtain. You would never know by looking at these curtains that they were so easy to put together. And that tacky glue did an amazing job. These are rock solid! 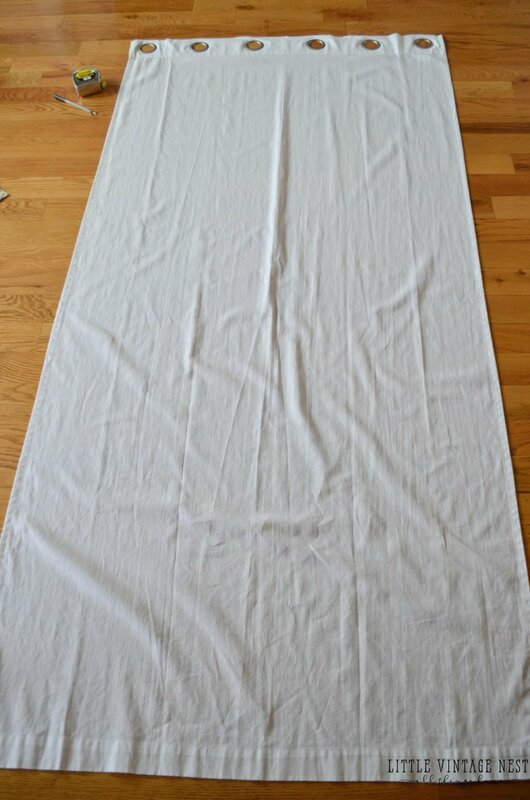 Well that’s it for my no-sew farmhouse style curtains. Please let me know what you think and feel free to ask my any questions. Thanks for stopping by! I need curtains for both of my little girls rooms! I love this idea! Genius. I guess I have to go thrifting to ding pretty aprons! Thanks so much Tiffany! 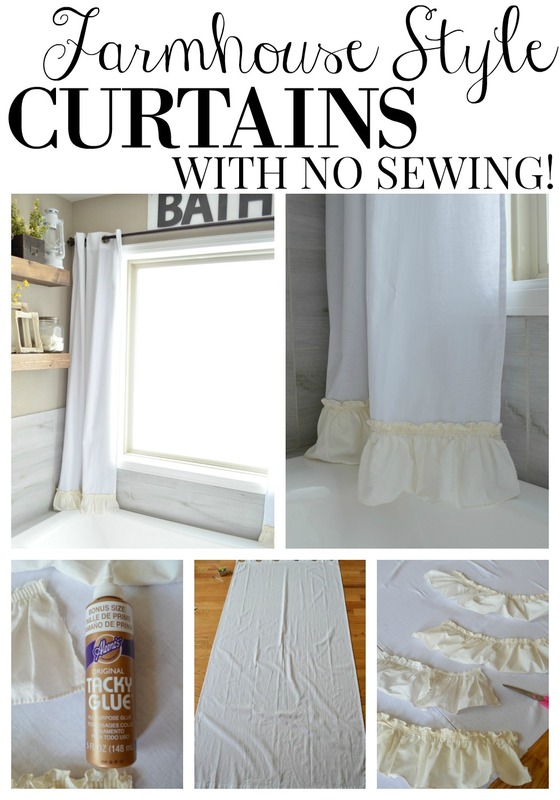 Definitely a cute way to spruce up an old white curtain. 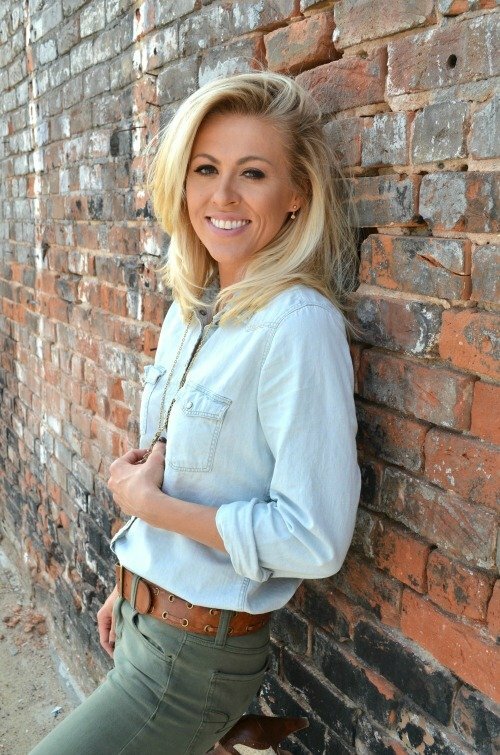 Love, love, love your style!! 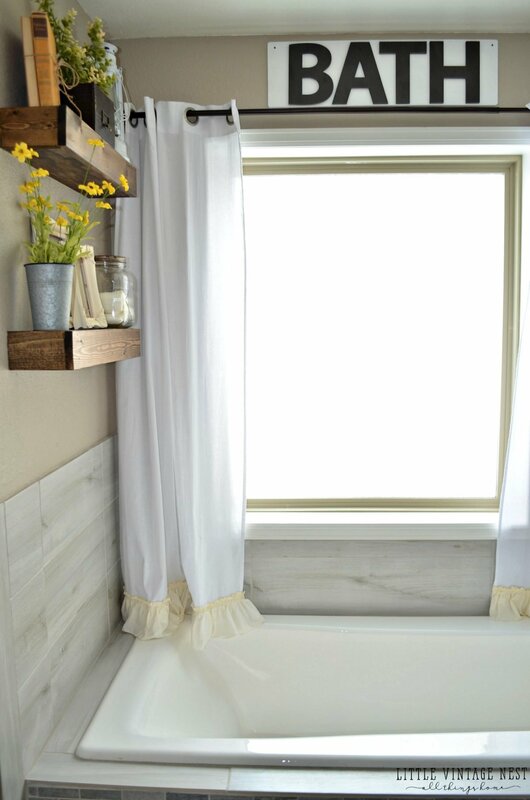 Did you make the BATH sign above the window? Aw thank you so much Mandy! I did make that BATH sign, I found the letters at Target. Super easy! Hi! Love your house! Do you have a tutorial on how you make the curtains in your living room, or did you buy them? Thanks! Love this! I’m needing some for my master bath so I can soak in my tub in privacy at night! Will the white curtains actually do that or should I go with a darker shade? Hmm not sure how much privacy you’d get with these, they’re fairly thin. But I’m sure you could find white curtains that would give you more privacy!